1 In a pressure cooker, boil 1 Cup (150 g) of soaked whole black gram and soaked red kidney beans in about 2½ Cups (400ml) of water along with ½ tsp turmeric. 2 In a separate frying pan, heat 2 tbsp vegetable oil and fry 1 tsp cumin seeds. Add 1-2 chopped onion and sauté until light brown. 3 Add 1-2 chopped tomatoes, 1/2 tbsp Ginger-Garlic Paste, 1 tsp Red Chilli Powder, ¼ tsp of turmeric powder and salt to taste. Cook on slow flame till the oil separates. 4 Now add the boiled dal along with about 1½ cups (200 ml) of water and bring to boil. 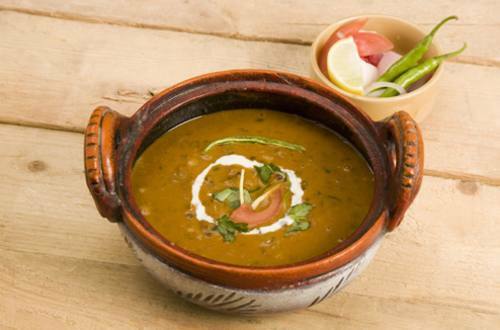 5 Add 1 tbsp (10 g) Knorr Chef’s Dal Masala, mix well and cook until the dal is thick. 6 Finish with dollop of butter and low fat cream. Mix well and enjoy!